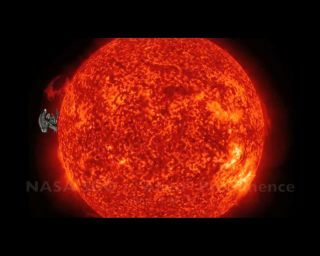 The extraterrestrial from the movie "Alien" is superimposed on the sun to show its similarity to the shape of a solar prominence that was seen on June 18, 2012 by NASA's Solar Dynamics Observatory. A new video that cobbles together footage from a NASA solar observatory shows a brewing eruption on the sun that bears resemblance to the iconic extraterrestrial from director Ridley Scott's sci-fi blockbuster "Alien." The wispy solar prominence was seen lifting off the sun Monday (June 18) by NASA's Solar Dynamics Observatory (SDO). The video, which was created by Romeo Durscher, an SDO public outreach officer at Stanford University in Palo Alto, Calif., incorporates nearly 15 hours of footage. "We called it the "Alien Prometheus Prominence," read the video's description, referring to Scott's latest film "Prometheus," which serves as a prequel to the Alien film franchise and is in theaters now. "Why? Watch the movie and find out." A solar prominence is a large, bright feature that is often shaped like a loop that erupts from the surface of the sun. These structures are magnetic fields full of hot plasma and gas that is trapped inside. "The red-glowing looped material is plasma, a hot gas comprised of electrically charged hydrogen and helium," SDO officials said in the video's description. "The prominence plasma flows along a tangled and twisted structure of magnetic fields generated by the sun's internal dynamo. An erupting prominence occurs when such a structure becomes unstable and bursts outward, releasing the plasma." Eruptive prominences can form and explode from the sun quickly, lasting only minutes, while other more stable prominences can be stretched out for hours or even days, NASA scientists have said. Solar prominences are sometimes called filaments when they are observed against the disk of the sun. While these eruptions are rooted to the solar surface, they reach up, sometimes hundreds of miles, into the sun's ultra-hot atmosphere, which is called the corona. Researchers are still unclear how and why prominences are formed, making these features intriguing subjects for solar physicists.